It’s similar to the both the “weeks, 2 day, day and subs days rate engine” and the “weeks, weekend, days and subs days rate engine”. In the “Weekend” field, specify the percentage you’d like to charge for on a weekend. By default, Current considers any rental that starts after 12pm on Friday and finishes before 12pm on Monday to be a weekend rental and will apply the weekend rate. You can modify this in the Options section at the bottom of this page. 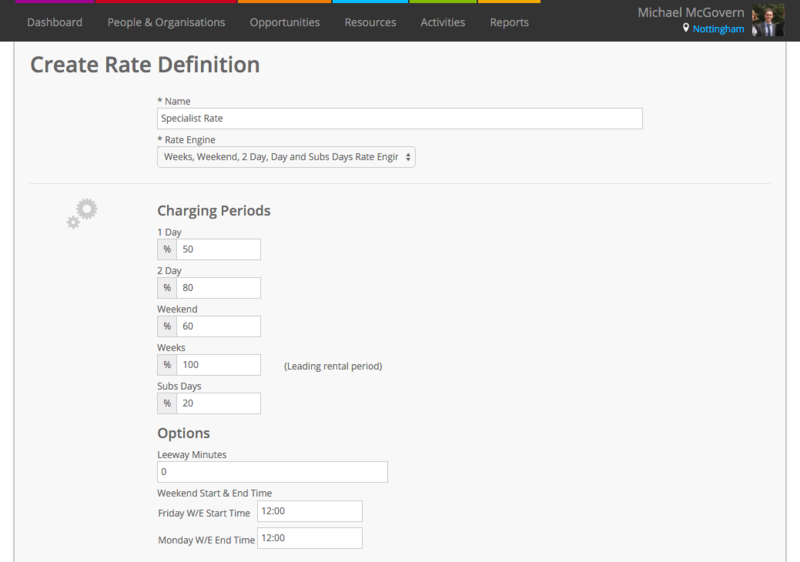 Use leeway minutes to adds a grace period or tolerance to the end of a rental. For example, if a rental that starts January 2nd at 11am and finishes on January 3rd at 10:30am then the total rental period is 1 day and 30 minutes. This is considered two days of rental charge. However, if you set 60 leeway minutes then the same period would be considered one day of rental charge as 30 minutes is less than the leeway minutes. Adjust when you consider a weekend to start and end. Current uses this information to determine when a weekend rate should apply. The weekend rate will be used when the rental period starts on or after a Friday at the time specified and finishes on or before the following Monday at the time specified.